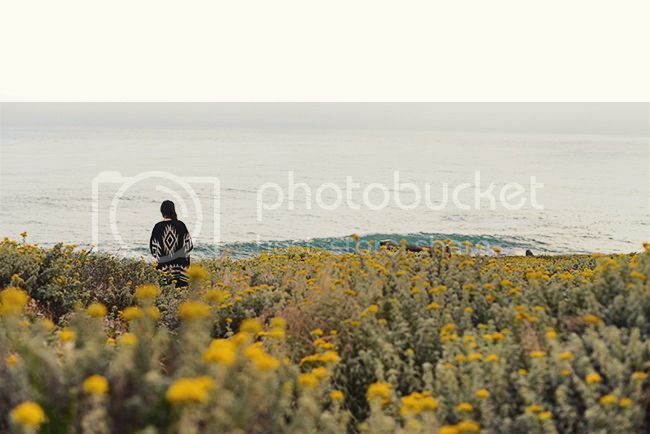 Halfway between San Francisco and Los Angeles lies the picturesque seaside town of Cambria. Wanting to take a weekend road trip, my boyfriend and I found ourselves making the 4 hour drive up the California coast to visit the Hearst Castle. We'd passed by it during our road trips up Highway 1 before, but never had time to stop and explore as we always tried to squeeze the 9-hour drive into a single day. 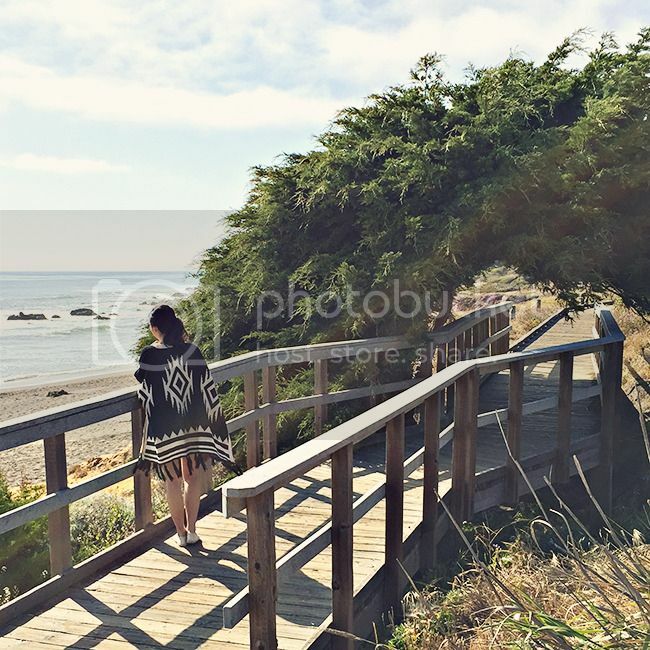 Being located 6 miles south of Hearst Castle, most of Cambria's visitors are probably castle tourists. 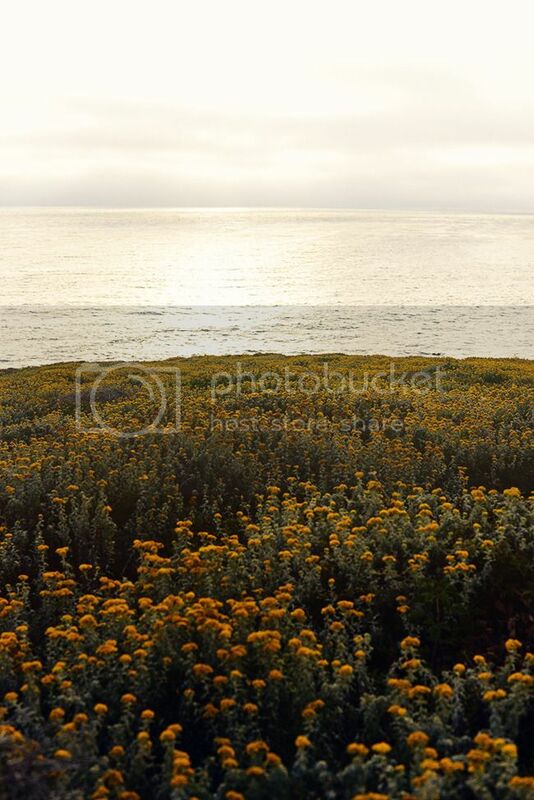 But the central California coast is a beautiful destination in its own right. It's so far removed from SF or LA that it definitely enjoys a much slower pace of life. There wasn't even a fast food restaurant around for 20 miles in each direction! Much to the dismay of my boyfriend who tends to get munchy late at night. 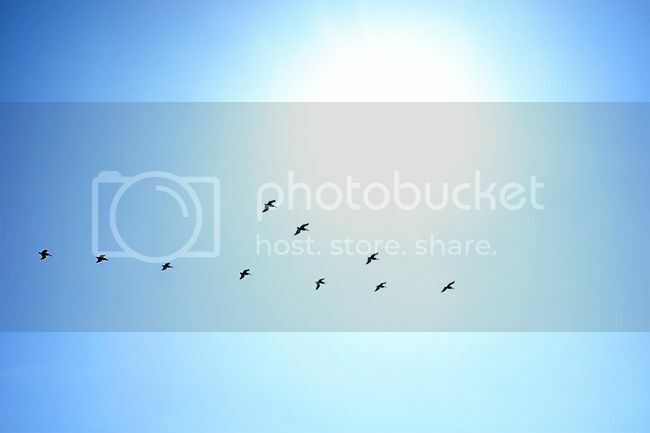 These photographs were taken at the Fiscalini Ranch Preserve. We were hoping to catch the sunset there, but the weather was prone to super quick changes all weekend long and the sun disappeared behind a thick blanket of clouds. It quickly got super cold after that! So we weren't able to explore as much as I would've liked. I would definitely like to check out more of the trails if I ever get another chance. Nevertheless, the little corner we got to explore was perfect. The yellow blooms were so beautiful and I love how there's a wooden boardwalk along the bluffs. There were also quite a few nice benches overlooking the ocean. It'd have made a super romantic sunset-watching spot if only there had been a sunset to see. 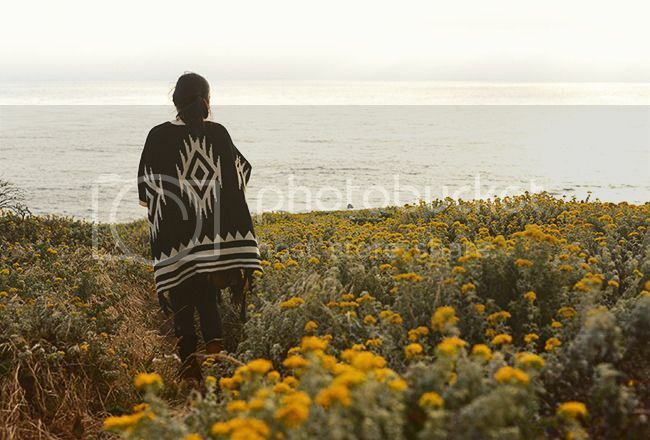 Aztec blanket poncho, c/o Savoir Faire. Knockout leggings, Victoria's Secret Sport (one of my fave brands for work out leggings!) Fringed ankle bootie, Minnetonka. 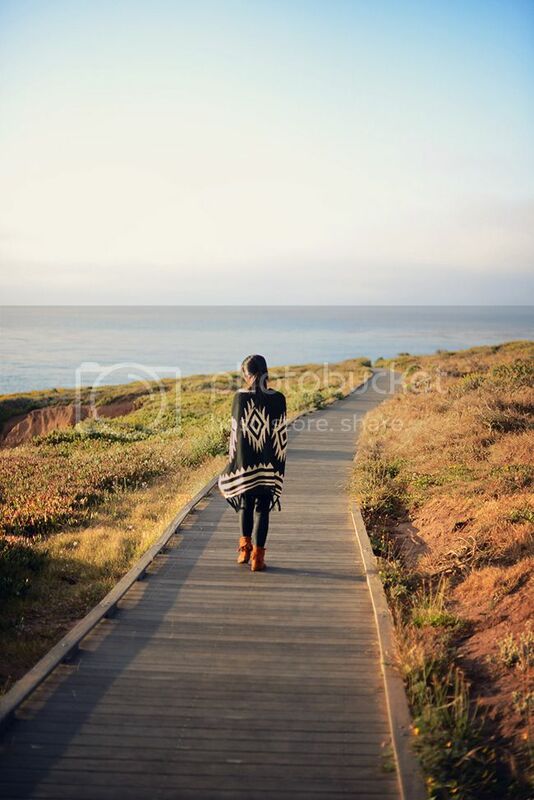 I packed the perfect thing to wear for such a relaxing weekend, my Aztec blanket poncho from Savoir Faire. 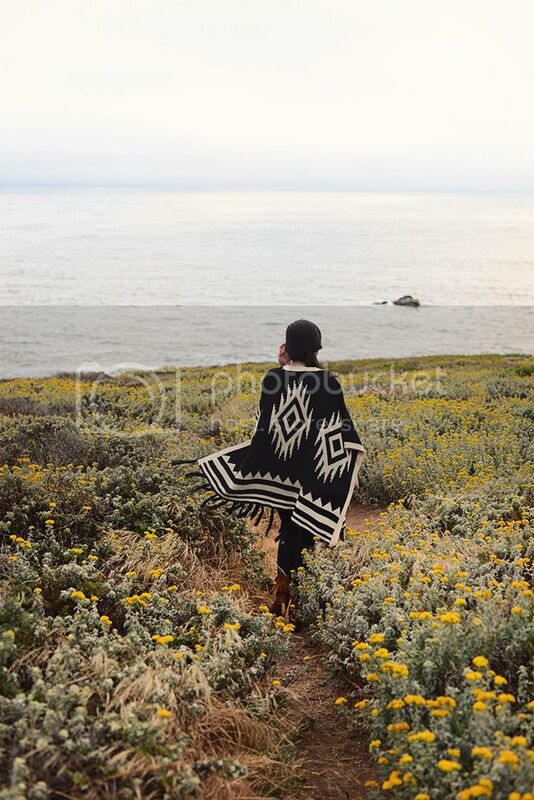 Half blanket, half poncho, it's the perfect companion to any road trip. There's something about hitting the open road that makes a soul feel light and free, and that feeling was reflected in my clothing choices for the weekend. Savoir Faire has tons of boho-esque clothing that perfectly encapsulates the feeling. Check them out and get 20% off your purchase with code SFgirlgang. Cream peasant blouse, Free People. Cuffed denim shorts, One Teaspoon (on sale! Size down because they run big). Slip on espadrilles, Soludos. Let's talk shoewear for a second. When I'm traveling I generally like to be as comfortable as possible, especially when it comes to footwear. I've had my fringed Minnetonka boots for over 5 years and they are STILL so good! They even survived a girl spilling lemonade all over them at a festival. I used to wear them to class all the time in college. I was that girl who loved to wear fringe and feathered earrings so they were right up my alley at the time. Nowadays I find myself pulling them out a lot when I'm packing for trips. Anytime I know I'll be in an almost-hiking like situation but I still want to look cute. Since I knew we'd be hitting the trails, I packed them. I also wore them to Machu Picchu in Peru and to Zion National Park. The traction on these guys is great! And they offer some ankle support too. They are also perfect for music festivals. My feet start to ache after standing around for long periods of time (does this only happen to me? I feel like most fashion bloggers can walk around in heels all day and not have any issues) but these moccasins have great shock absorbency and cushion. I also picked up my first pair of Soludos a little while back because they were on sale and I am now a complete fan. I definitely need to get a few more pairs. They might be the ultimate vacation shoe. I had always thought they might be uncomfortable because of the jute rope sole, which also serves as the footbed, but the opposite is true! After a super short break-in period, they are one of my most comfortable pairs of shoes. Definitely my most comfortable shoes that don't require wearing socks. I was never a huge fan of TOMS because the elastic part at the top digs into my foot. So Soludos are my new go-to slip-on. We stayed at one of the plentiful inns along Moonstone Beach Drive which also had a lovely wooden boardwalk along the beach. It's not something you really see at So Cal beaches so I thought it was super quaint and cute. We were starving after our visit to the castle but walked along the beach a bit since the restaurant by our inn, the Moonstone Beach Bar & Grill, didn't open for dinner until 5 pm. There were already people lined up when 5 pm rolled around! Without too many other dining options around, I guess others in Cambria were as hungry as we were. 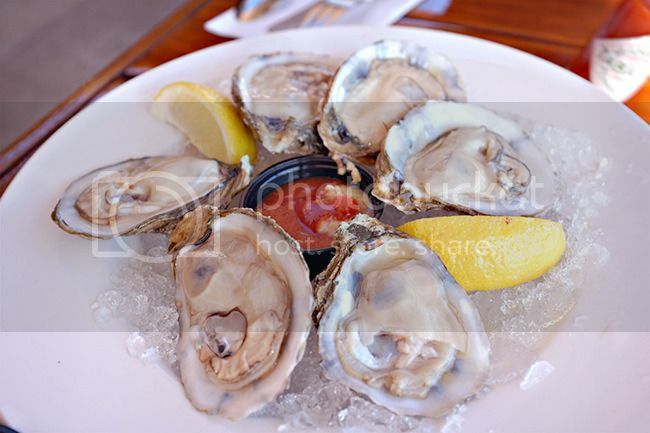 We shared some oysters on the half shell (delicious!) and I had to order the clam chowder since more than one yelper claimed that it was the best ever. And also because I love bread bowls! 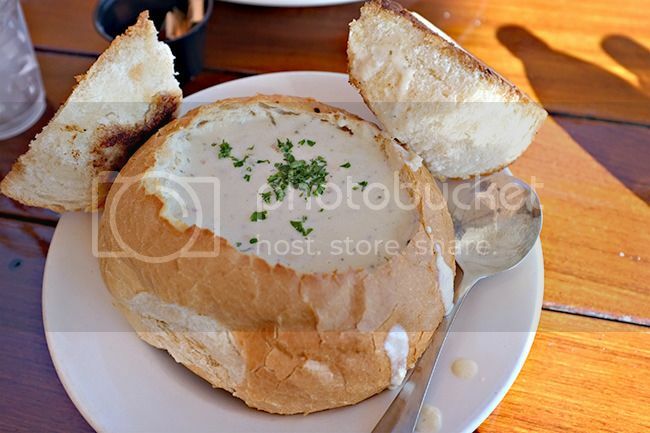 I'm no clam chowder connoisseur, but I thought it was pretty darn delicious. The bread was buttered and grilled, so it was so good with the clam chowder, which also had some bacon in it though I couldn't tell. My boyfriend ordered the New York steak of course; he's quite predictable and always goes for meat and potatoes if it's an option. This is actually only half the order since we paid an extra $4 to split the plate into two (so worth it since we got double the sides). My poor boyfriend was so hungry that he gobbled up his half very quickly. 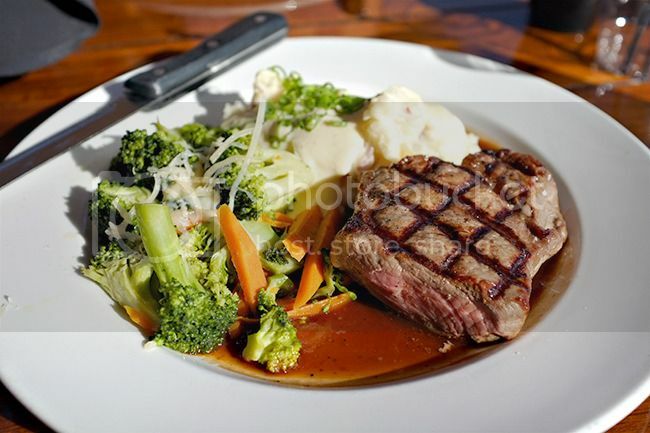 All in all, the food surpassed expectations and the service was great. These photos are so beautiful!! 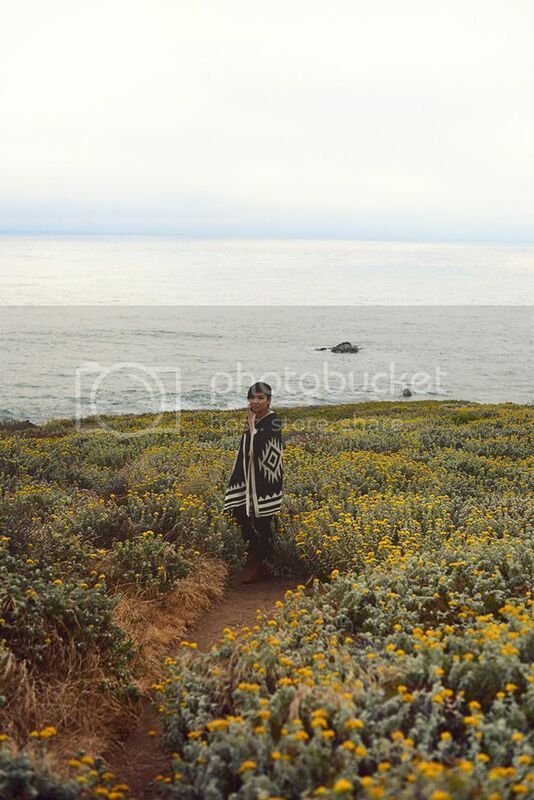 Love the scenery and your poncho is gorgeous. Hope you had a lovely time! What gorgeous photos. I love the poncho too. You look beautiful too. such a nice photos! love the cape you are wearing! 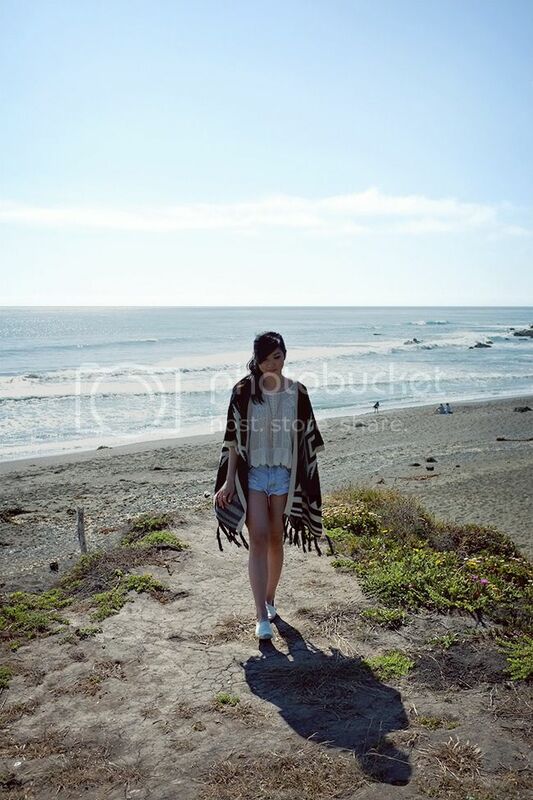 The poncho was so perfect for this location! And yum the food looks delicious! 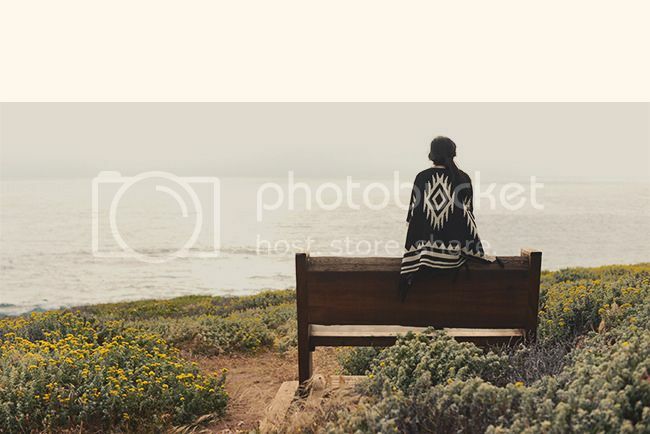 Oh wow, the photos are stunning and I am so in love with the poncho. Definitely comfort for travelling! Also, the good looks soooooo good! WOW!! the pictures are beautiful. You look gorgeous! 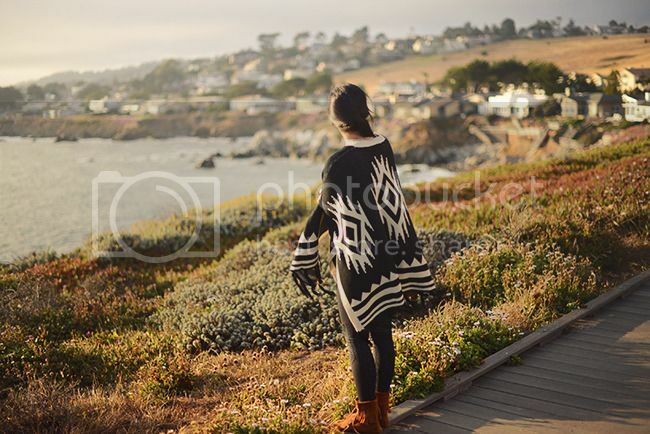 wow amazing cape sweater and these photos are breathtaking! xO! 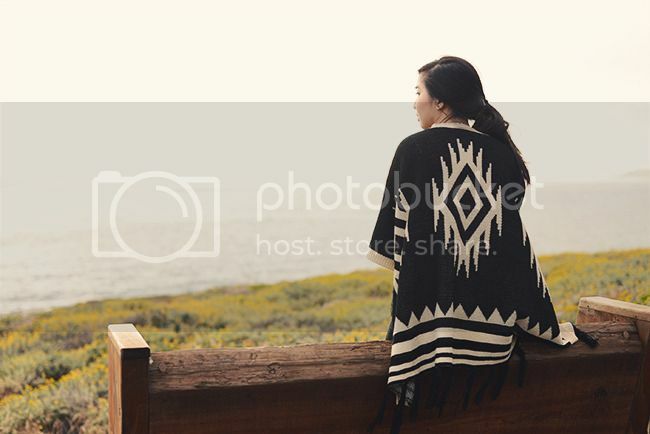 Beautiful photos, I am loving your blanket! 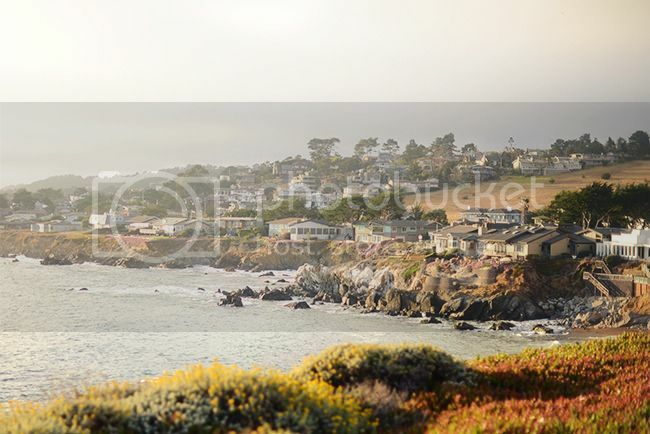 Cambria looks like such a pretty town! I wish I could take a road trip across California one day. The poncho is awesome! I'm staying over at a friends this weekend so I think I'll look for something blanket-like in my closet to bring. California has so many beautiful places. I always enjoy your pictures!